Here I'm considering the third option to my enigma. My known ancestry is 100% English. However, autosomal DNA tests for Ancestry, by commercial companies, and by third party analysis, suggest that I have a mixture of European ancestries, including varying percentages of Southern European. I'm trying to best explain this phenomena. In previous posts, I considered 1) that my paper record is incomplete, or biologically incorrect. 2) that something ancient is picked up in analysis of present day English testers - that maybe reflect shared algorithms with ancient admixture, perhaps prehistoric, or Roman. Now in this post, I consider the third option. That commercial DNA companies exaggerate their claims to be able to differentiate to any successful degree, between different regions of Europe in my ancestry. If this is indeed the case, it has significant repercussions for testers for example, in the USA, Canada, Australia, etc. If they have a poor paper trail, and poorly known ancestry, maybe it's all too easy for them to regard such DNA tests for ancestry, as indisputable and accurate truths. Commercial DNA companies for Ancestry, are under pressure to supply to market demands. Their markets have been dominated particularly by USA customers. Some of them seasoned genealogists with good quality paper trails. Others, attracted by the easy option to know their ancestry before the, as 23andMe puts it, the Age of Migration before the past few centuries. Instead of spending a lifetime chasing documents, they can simply send a DNA sample to a company, and know their roots. People trust the science of DNA testing for ancestry. That is the demand that commercial companies can cater for. But what if their abilities to accurately detect ancestry from Autosomal DNA is exaggerated? Lack of agreement between analysis. As one evidence. Test autosomal DNA with three different companies, and you will receive three different results. That is well known in genetic genealogy circles. Some apologists excuse it away by pointing to the different companies claims, to be focusing on different periods. 23andMe say that they zoom in on 500 years ago, by rejecting short chains. Is it really, really possible yet, to be able to zoom in on one particular period? I'm not convinced. Is it even possible to securely locate all ancestry from the past 500 years? I'd expect genetic recombination to wash away an awful lot of ancestral DNA long before that. The truth is that beyond our great great grandparent's generation, there is less and less chance of us carrying any surviving DNA from any one particular ancestor! Especially from the autosomal DNA passed down on your father's side. You might have a Balkan g.g.g.g grandfather, but chances are, there will be no evidence of their existence remaining in your autosomes. His DNA, and all that belonged to his Balkan ancestry, will be lucky to survive the following 250 years, never mind 500 years. My Y-DNA has strong evidence that I had an Asian ancestor on my paternal line, arrive in Southern England between 1,800 and 500 years ago. However, nothing remains in my autosomal DNA analysis that suggests Asia. Washed away. Getting back to those three companies giving three different ancestries. My South European percentages have varied from 2% (with a hint at Iberia), to 19% (with a hint at Balkans), to FT-DNA's claim of 32%! Eurogenes K13 hints at Iberia in it's admixture programs on GEDmatch. One more thing. Autosomal DNA tests for ancestry do not use ancient DNA references. Not yet anyway. They instead use present-day references, often from their own customer client bases, based on what ancestry they claim. This is not necessarily the DNA that existed in past populations. Populations and genes shuffle, genetic drift forms. 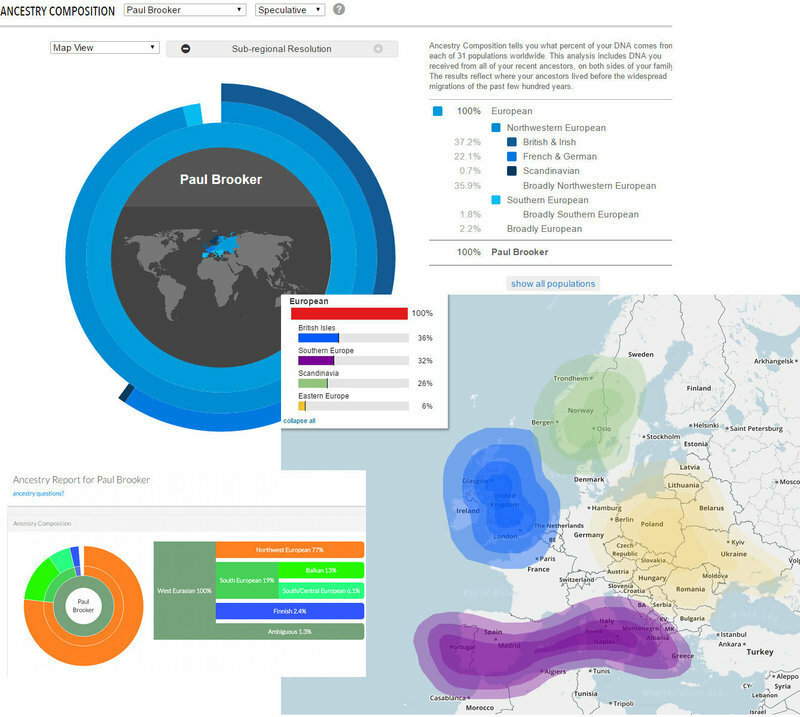 I recently read a report that FT-DNA Y data for NW Europe heavily biases to Irish ancestry. Therefore, references from Americans of Irish and / or British descent, will bias to the West. The quality of a reference is critical. Am I saying that autosomal DNA testing for Ancestry is all a waste of time? Actually no, not yet. The tests DO find me to be pretty much 100% European. That is a success. Some tests even find me with a degree of confidence, to be NW European. That is awesome. However, beyond such regional level, should we be trusting such tests to be providing concrete results, infallible "truths" with a high degree of accuracy? Shouldn't we be cautious, and regard such speculations as just that - speculations, to be assessed by other forms of evidence? Some of my ancestors might have lived in Southern Europe. Maybe Option 1 was correct - one of my Norfolk ancestors brought a Portuguese wife home from the Peninsular Wars. Perhaps. Maybe Option 2 was correct - the patterns that DNA companies pick up as Southern European, are ancient, related to Neolithic, Iron Age, or Roman admixture from the South, or sharing ancient ancestry with Southern Europeans. Maybe. I'm not at all disenchanted with DNA testing for ancestry though. I've commissioned five so far this year, including three autosomal DNA tests. This leads me to my most recent commission. Perhaps this one will convince me more. It's a very new test. I'll post on that next.